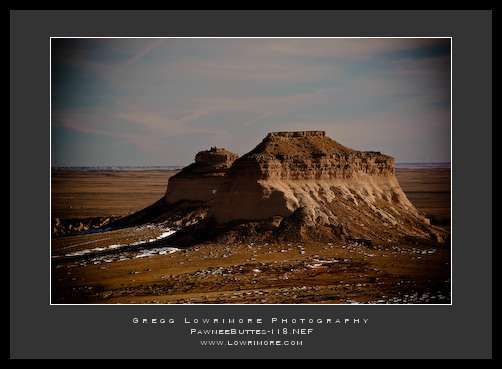 I took off very early this morning on what was to be a scouting trip to the Pawnee Buttes and the Grasslands that surround them, up in north central Colorado. I did a little research Saturday night and uncovered a Visitors Guide PDF as well as a detailed map of the area here. My GPS unit sent me off to New Raymer sort of the back roads route: out Hiway 66, to 85 north, to 392 east to Briggsdale. Having gone this route now, I can say it’s more scenic, but if one wants a direct, all major highway route, then head up I-25 to Ft. Collins and head East on Highway 14 to Briggsdale. Once in that area, take the road north de-marking the way to “Keota” and then follow the signs to “Pawnee Buttes”. Nice gravel dirt roads leading one all over the Grasslands are to be found then. 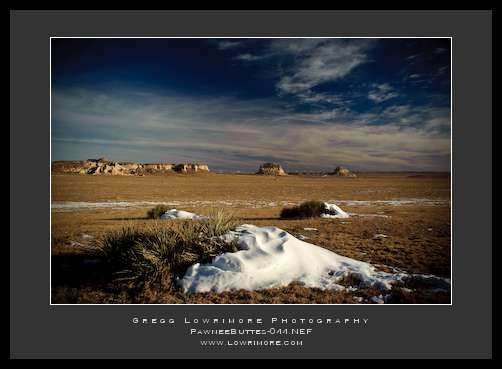 I recommend heading straight for the Buttes to start your photography. And from the Erie/Broomfield area, plan on 2 hours to get to the Buttes — surprisingly, it’s a haul. 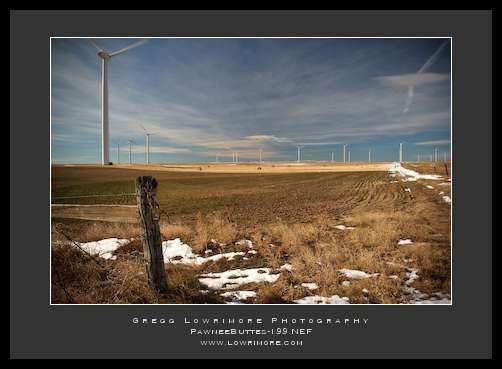 First up was the Buttes and a couple of the numerous cattle windmills in the area. 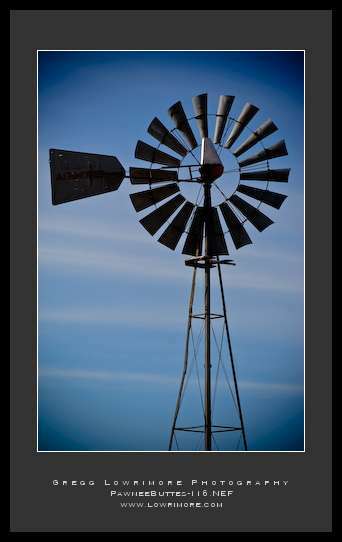 Numerous windmills dot the vast grasslands as ranchers are bringing up water for their cattle. 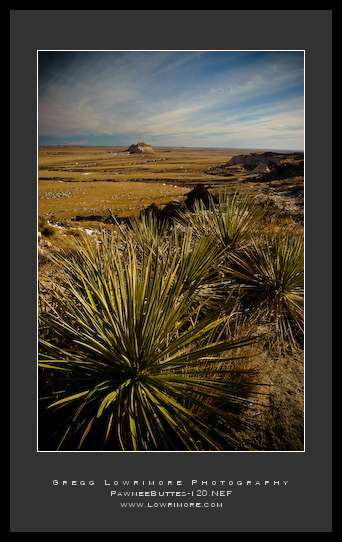 There’s a lot of private land in and around the National Grasslands, so be careful. Ask first before venturing out onto private land. 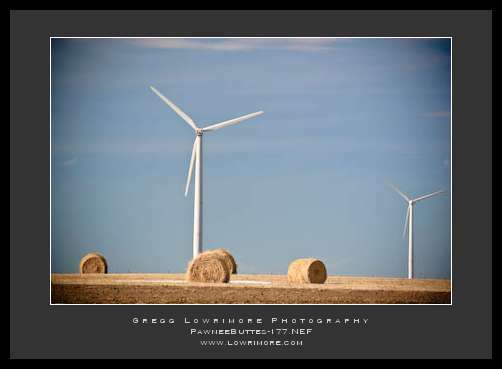 Then on some of the private land I came across these wind turbines being used to generate electricity. These things are very tall and massive when you’re up close to them like this. I’ve always seen these from a distance, so they were quite impressive today. This area would do well for an early morning (sunrise) or late afternoon photo excursion. The shots above with the Buttes in them are basically looking East-Northeast. There are a few spots just North of New Raymer that would yield a good angle for sunrise light on the Buttes; however, the Overlook area images are all from the West looking easterly at the Buttes — sunset lighting would be ideal. Early morning or late afternoon would do well for the wildlife in the area as well. Any dramatic weather/lighting would work best on the windmills and turbines. 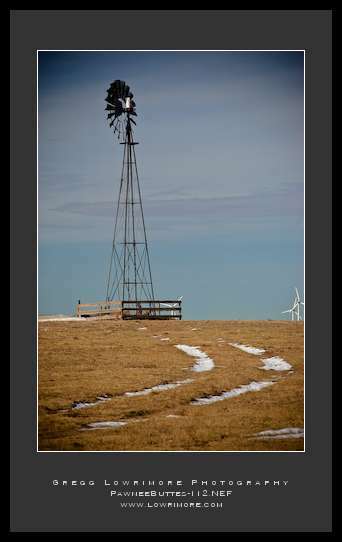 There are many of the old wooden windmills dotting the grasslands and one could almost get any angle for a nice image. 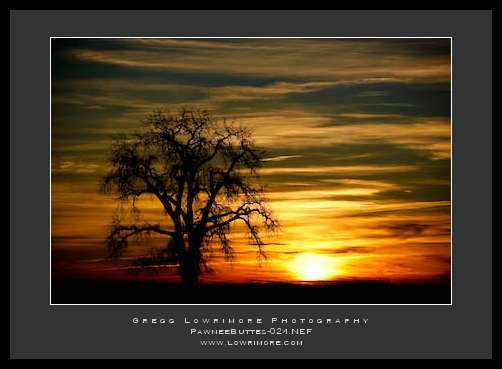 The grasslands’ landscape as well as the several abandoned homesteads in the area would bode well for a sunset shot as the setting sun would be sweeping across the landscape very nicely (assuming no afternoon clouds which so typically arrive here in Colorado in the afternoons). One interesting thought I had while out there today, looking down and being careful not to step on the fragile cactus plants in my walking, made me wonder how the wildflower blooms would be out here in the spring/summer. Anyone know what the wildflowers are like out there? What month are best for viewing, etc.? Finally, I traveled the scenic byway loop today. Starting in New Raymer heading north into the Grasslands, then westerly towards the Buttes, then somewhere near Keota, I headed South and came out on Highway 14. Very nice drive on well maintained gravel dirt roads. Snow drifts could be a problem though, so watch the weather and plan ahead. If you go sometime, let me know how your trip was in the comment section below. 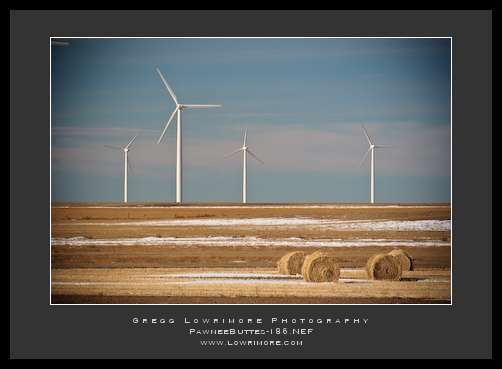 Posted in Shoots and tagged Briggsdale, cattle, colorado, coyote, electricity;, GPS;, Highway 14;, homestead, Keota, National Grasslands, New Raymer, Pawnee Buttes, prairie, sunrise, turbines, windmill by greggl with no comments yet.